A quick check-in to post my March goal for A Lovely Year of Finishes. I have been working on a quilt for the 2014 Pantone Quilt Challenge. Today I finished piecing together the quilt top. My goal is to have this quilted and bound by the end of March. 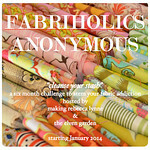 Although at the moment I have no ideas for backing fabric or for how to quilt it! I am sure inspiration will strike soon :) It looks great, I am looking forward to seeing how you finish it. I LOVE this!! The orchid fabrics look so beautiful amongst the neutrals. 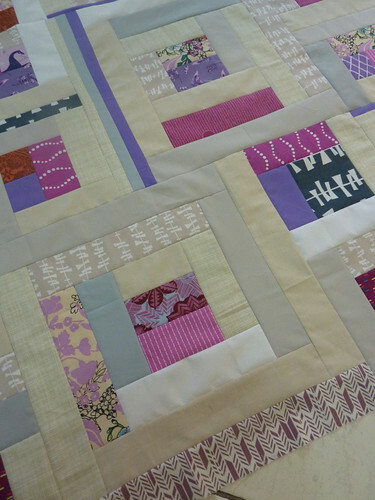 As for quilting you could stitch in the ditch around the blocks and then add some hand quilting with perle cotton. Or machine quilt wavy lines across the quilt. I know you'll come up with the perfect solution. This is looking really pretty - can't wait to see the full reveal! Love the quilt! The neutrals really make the Pantone Orchid purples and pinks shine. Wow! I love it already! Can't wait to see it all finished! It looks beautiful Deborah! I'm sure inspiration will strike soon and you will have a gorgeous quilt finish by the end of the month. This quilt top is looking a-maz-ing! Purple just happens to be my favorite color:) Looking forward to seeing it in the challenge. Good luck!!!!!! I love these colours you've used - so pretty and calming. Good luck with finishing it. It is an absolute beauty. Lovely delicate tones, it's beautiful! A Practical Project and a Giveaway!